Coral bleaching is among nature's spookiest reactions. One day, a section of coral is teeming with life and color. Then, suddenly, all that's left is the bleached out outline of that empty coral, a ghost coral in empty waters. And we could be headed for a truly landscape altering coral bleaching this year. Top image: Joyce & Frank Burek via NOAA. The one spot of bright news in all this is that, it turns out that coral can survive bleaching. Once, perhaps even twice. But, the longer it lasts and the more times it hits, the less likely the coral is to ever return. And the severity of the outbreak has a lot to do with the long term effects as well. 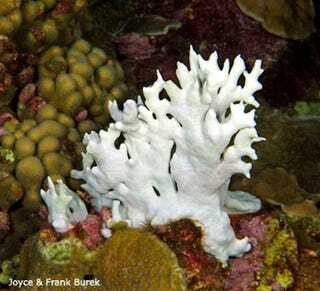 Ten years ago, a single, exceptionally severe coral bleaching event was responsible for knocking out half of all the U.S.'s coral in a single blow. Whether we're about to see another event on that scale remains to be seen.